Millcreek Herbs LLC - Herb Articles - Healthcare: Easing Stress and Frustration - Dedicated to the understanding, wise use and enjoyment of herbs. Merry's articles and herbs research will help you to learn more about medicinal herbs, culinary herbs and the wellness benefits of Complimentary Alternative Medicine (CAM). Last Saturday as I shopped at one of the big box stores, I felt irritated by the crowd because it was hard to maneuver with my cart. Though I had shopped carefully, I was disappointed at the checkout when as usual my purchases totaled more than I had expected. Getting out of the parking lot was aggravating and on the way home, I found myself cranky and driving too aggressively. While unpacking my purchases at home, I turned on the TV but immediately turned it off as I felt my blood rising in frustration and anger at the day's news. I am concerned that I am wound too tight and with the holidays approaching I fear one more stressor might put me over the edge. Do you have any herbs that can calm me down? Living life tightly wound can definitely have adverse effects on your health. We would probably all aspire to having a more peaceful mind during these times of turmoil, but many of us feel at a loss about how to begin, much less accomplish that state. This is exactly where herbs can help! Some suggestions would be to start using American ginseng and eleuthero (formerly known as Siberian ginseng) which are adaptogenic, meaning they assist your body in adapting to stress. They keep your body from overreacting to stress, so using ginseng regularly, you might find sleep coming more easily and that you can entertain other thoughts and constructive activities beyond your worries. If anxiety or mental chatter is too much of a distraction, try kava kava, one of the best anti-anxiety herbs and safe to use if it is prepared properly. Shifts in blood chemistry can contribute to a sluggish or agitated state of mind; a hangover from drinking too much alcohol would be an example. The run-down, tired feeling that occurs an hour after eating something sugary is another. Food allergies, even mild ones that you suspect but are not quite sure of, can have the same effect. Herbs like turmeric and Oregon grape can help clear the system of toxic overload. Goat's rue and cinnamon can even have a glucose balancing effect. In times of stress, herbs like echinacea and astragalus support the immune system and help ward off illness. Multivitamins can help combat nutrient depletion caused by stress. 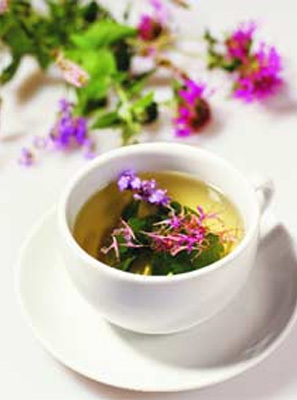 Nourishing herbs like oat straw (good for the nervous system), nettle and dandelion leaf (for minerals), cleavers and Mormon tea combine to make a nice tea; adding a little mint and chamomile makes the flavor even more pleasing. Stress can cause overeating or not eating, as well as digestive problems such as sour stomach, constipation, or diarrhea. Herbs like fennel and marshmallow can calm and soothe the digestive tract and bitter herbs like gentian and arugula can stimulate it. A whole foods diet, with lots of nourishing and detoxifying fruits and vegetables and the proper amount of protein each day to balance out blood sugar yo-yos, will go a long way to helping you feel balanced. Fragrant essential oils can ease the mind and body through the olfactory system. Lavender, bergamot, rosemary, peppermint and the more expensive rose can all have calming effects. Use only unadulterated, pure essential oils to get the therapeutic effect. Look on the packaging for a guarantee or a copy of a certified chemical analysis. Herbs can be useful in helping you feel better mentally and physically and maintain health and emotional stamina. Once you feel less susceptible to being blown off course by external events, you can think of other ways to support your own peace within.